“We believe in the same organization that existed in the Primitive Church, namely, apostles, prophets, pastors, teachers, evangelists, and so forth” (Articles of Faith 6). The Church of Jesus Christ of Latter-day Saints claims that the loss of the organization and offices of the first-century church reflected the church’s corruption and apostasy, and that the LDS Church alone has that organization and those offices restored and operating today. However, this claim does not bear close examination. The LDS Church organization is radically different from the New Testament church, and the LDS offices typically bear little or no resemblance to ministry offices in the early church. A. Jesus Christ did not create an organization. "The early church had bold, servant-hearted leaders who loved Christ and were led by the Holy Spirit. It did not have one religious organization to impose unity on all Christians from the top down. There should be no question as to which is more valuable." The LDS doctrinal manual Gospel Principles asserts, “The Church of Jesus Christ was a carefully organized unit” (89). The evidence of the New Testament does not support this claim. The only ministry position that Jesus instituted, according to the Gospels, was that of the apostles. (I will comment on the LDS office of the “Seventies” a bit later.) According to Gospel Principles, “That there might be order in His Church, Jesus gave the greatest responsibility and authority to the Twelve Apostles” (89). The New Testament, however, says absolutely nothing about church order as an essential function of the apostles. It is common for people to refer to the “office” of apostle, and the term if used loosely or informally is fine. However, technically speaking, the position of apostle was not an office. That is, Jesus did not appoint the apostles to function as officers in an organization (like members of a board of directors, for example, or generals in an army). They were, rather, authoritative witnesses to Jesus Christ, through whom God revealed the gospel and whom the Holy Spirit empowered to explain and testify to the truth of the gospel of Christ, both in words and miraculous deeds (Mark 3:14-15; Acts 1:2, 8, 21-26; 2:42-43; 2 Corinthians 12:11-12; Ephesians 3:5; 1 Timothy 2:7; 2 Timothy 1:11). The information that we have in the Book of Acts and in the rest of the New Testament shows that the church of the first century never had a formal, uniform organizational system. Naturally, in the very beginning of the church, the apostles performed leadership functions, primarily as authoritative teachers (Acts 2:42). The assignment of specific ministry duties to other believers took place as the need arose and typically in an informal fashion. For example, the twelve apostles instructed the local church in Jerusalem to choose seven men to administer the distribution of food so that the apostles would be free to focus on prayer and teaching. The apostles themselves played no role in choosing those seven men, but only prayed and laid hands on them after the congregation had chosen them (Acts 6:1-6). One of those seven, Philip, later went to Samaria and preached the gospel there, then went to the desert road to Gaza to preach to an Ethiopian (Acts 8:5, 26-27). Philip’s movements were apparently neither initiated nor directed as part of an organized mission. The lack of any formal organization “running” the church is especially clear in the case of Saul of Tarsus—better known as Paul. He became an apostle as a result of the Lord Jesus appearing to him directly, with the group of existing apostles playing no role in his receiving that commission. Indeed, the believers in Jerusalem were initially afraid of Saul because they did not believe he was one of them (Acts 9:1-28). Saul later joined with Barnabas in teaching at the church in Antioch (Acts 11:25-26). The two men were part of the Antioch church’s group of “prophets and teachers,” which under the prompting of the Spirit sent them on an evangelistic mission (Acts 13:1-3). We know this mission was not conducted under the direction of the Jerusalem church because later the Antioch church sent Paul and Barnabas to travel to Jerusalem to defend the ministry to uncircumcised Gentiles (Acts 15:1-2). As the rest of Acts 15 makes clear, the leadership of the Jerusalem church had not yet taken a position on the matter (see 15:6-7). For his part, Paul did not consider himself to be subject to the Jerusalem apostles. In his epistle to the Galatians, Paul says that he and the Jerusalem apostles (particularly Peter) had an understanding that they had their different fields of ministry, and they endorsed each other’s work, but the Jerusalem apostles had no authority over him (Galatians 2:1-10). Indeed, in one meeting Paul actually confronted Peter about his hypocritical behavior because it was inconsistent with the gospel (Galatians 2:11-21). The early church had bold, servant-hearted leaders who loved Christ and were led by the Holy Spirit. It did not have one religious organization to impose unity on all Christians from the top down. There should be no question as to which is more valuable. B. The LDS Church organization differs radically from the New Testament church movement. Although the terminology is very different, the structure of the LDS Church is similar to that of the Roman Catholic Church, which is headed by a Pope who has a group of cardinals associated with him in the governing of the Catholic Church worldwide. The worldwide church is divided into territories called dioceses, with each diocese run by a bishop (which is more like a stake president in LDS religion). In turn, each diocese has some number of local congregations, called parishes, each of which is run by a priest. If anything, the LDS Church has an even more elaborate and finely structured hierarchy than the Catholic Church. It should be obvious to anyone who has read the New Testament that there was nothing like this ecclesiastical hierarchy in the first-century church. As I have already explained, the early church lacked any formal organization or centralized administrative bureaucracy. The LDS Church claims otherwise, notably in its Sixth Article of Faith: “We believe in the same organization that existed in the Primitive Church, namely, apostles, prophets, pastors, teachers, evangelists, and so forth.” As Robert E. Wells put it, “We have, in original form, everything that has ever been brought to earth that is part of the great Plan of Salvation—nothing altered, nothing modified. We believe in the same priesthood authority held by the ancients; the same organization as the primitive Church, headed by Apostles and prophets; the same spiritual gifts; the same ancient scriptures as well as new latter-day scriptures—the Book of Mormon, the Doctrine and Covenants, the Pearl of Great Price” (Ensign [conference report], Nov. 1995, 65). The facts simply do not support this claim. C. LDS Church offices generally have no precedent in the New Testament. As we saw in some detail in the article on Mormon priesthood offices and the Bible, “The Church was organized with the same offices as were in the ancient Church. That organization included apostles, prophets, seventies, evangelists (patriarchs), pastors (presiding officers), high priests, elders, bishops, priests, teachers, and deacons. These same offices are in His Church today” (97). There is no office of seventies in the Bible. On one occasion, Jesus during his earthly ministry appointed seventy disciples to go out in pairs to villages and towns in preparation for his own arrival there (Luke 10:1). Seventies in current LDS organization are regional administrators. The New Testament ministry positions of pastors, elders, and overseers are somewhat analogous to that of bishops in the LDS Church, though not quite the same thing. No clear line can be drawn biblically between pastors, elders, and overseers (translated “bishops” in the King James Version). All are mature believers responsible for the spiritual care of the congregation. 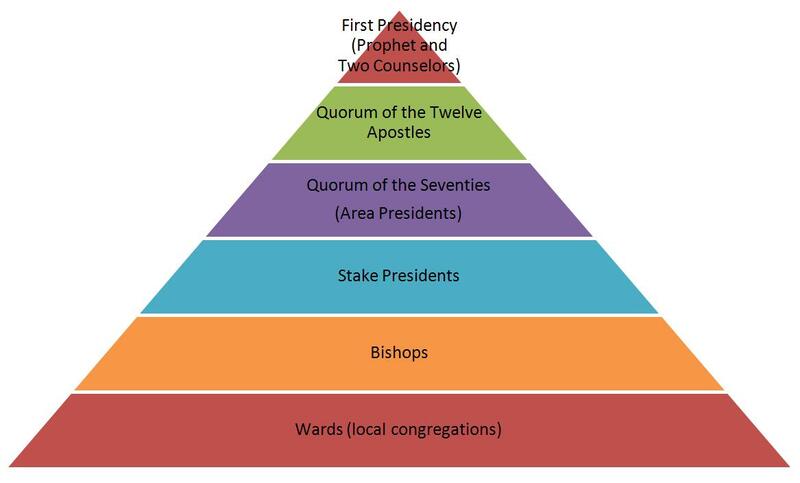 Bishops in the LDS Church are primarily administrators of the wards (local congregations), though they typically also exercise spiritual responsibility. There is no New Testament precedent for stake presidents, either in word or in concept. The New Testament Christian churches had no offices or positions of priests or high priests. Those were part of the old covenant religious order that became obsolete when Jesus Christ offered the final, ultimate sacrifice for sins and ascended to heaven as our one and only, eternal high priest (Hebrews 7-8). Teachers in the New Testament were adult Christians especially gifted to impart to others accurate understanding of biblical truth—not, as in the LDS Church, 14-year-old boys charged with helping to prepare the sacrament or visit the homes of other church members. Deacons in the New Testament were adult Christians who took the lead in the church’s works of service, especially for the poor, widows, orphans, and others in similar need—not 12-year-old boys passing the sacrament and taking care of church properties. Again, not only do these LDS offices generally not correspond with Christian ministry positions in the New Testament, but the interrelationships of these offices in the LDS Church are structured in a hierarchical order with no precedent in the New Testament church. D. No one prophet or apostle, or even group of apostles, ruled over the worldwide church in New Testament times. The early church had apostles and prophets, but no one man ruled over the whole church. The apostle Simon Peter was, of course, the leader of the apostolic band, especially in its beginnings, and in his ministry he opened the door, as it were, to Gentiles (non-Jews) to become part of the church. This is probably what Jesus meant when he said that he was entrusting “the keys of the kingdom of heaven” to Peter (Matthew 16:19). However, as the church grew and expanded, Peter does not seem to have functioned as a ruling figure over all Christians or all churches. This can be seen clearly in the Jerusalem Council, a meeting that took place about AD 49. At this council, Paul and Barnabas reported to their colleagues “the apostles and elders” of the Jerusalem church about their efforts and fruit in evangelizing Gentiles. Acts reports speeches by both Peter (Acts 15:7-11) and James (15:13-21) in support of the Gentile mission. Neither of these two men seems to have functioned as “the prophet,” but James likely functioned as the presiding leader in the Jerusalem church, with the rest of the apostles and elders agreeing with his “judgment” of the issue (15:19). In later years, Peter traveled away from Jerusalem, while James is known from other historical sources to have continued as the lead apostle in the Jerusalem church. Neither of them ever claims or is treated as the earthly head or ruling prophet of the worldwide church. The letter from the Jerusalem Council’s apostles and elders to the Gentile churches (Acts 15:22-29) is the only example we have from the apostolic era of the leadership of one church issuing any sort of directive to other churches. It was natural and appropriate for new churches to look to the Jerusalem apostles for leadership and direction on controversial matters. The event is not, however, an example of bureaucratic direction from the top down. The emphasis of the letter is on assuring the Gentile believers of acceptance and asking a minimum of cooperation from them in respecting Jewish sensibilities. The Jerusalem church obviously had not had any sort of hierarchical system in place before the crisis addressed in the Jerusalem Council, or the controversy would not have arisen in the first place. Nor did the Jerusalem church establish such a hierarchy or centralized system of controls after the Council. They simply sent a letter with Paul and other men to the Gentile churches, and that was the end of it. E. The apostles were founding witnesses and teachers for the church’s first generation, not officer-holders in an ecclesiastical bureaucracy. The apostles made no provisions for the continuation of the “office” of apostle after their death. The only apostle ever replaced (not succeeded) was Judas Iscariot, the traitor who betrayed Jesus and who was replaced by Matthias (Acts 1:15-26). Gospel Principles is therefore mistaken in citing the example of Matthias as evidence that Christ intended for a “Church organization” governed by twelve Apostles to continue (90). The apostles died out over a period of decades, “one by one,” as Gospel Principles acknowledges (92), yet no effort was made to appoint successors or replacements for them. Both Jesus and his apostles warned repeatedly about false apostles and prophets (Matt. 7:15; 24:11, 24; Mark 13:22; 2 Cor. 11:13-15; 2 Pet. 2:1; 1 John 4:1-6; Rev. 2:2; 16:13; 19:20; 20:10), but never once expressed concern about the church losing its way with a lack of apostles or prophets. That is, the New Testament associates apostasy with false apostles and prophets, not with a lack of such leaders. Peter and Jude, writing toward the end of the apostolic era, urged Christians to persevere in the faith by remembering what the apostles said (2 Peter 3:1-2; Jude 17). Their instructions were for believers to guard against false doctrine by retaining and remembering what the first-generation apostles had said, not by listening to living apostles that would succeed them. That is because there were going to be no such apostles. Paul’s description of the apostles and prophets as the “foundation” of the church distinguishes these Christian ministers from the “evangelists, pastors, and teachers” whom he mentions along with them in Ephesians 4:11. Mormons (and others) sometimes argue that apostles and prophets are needed for the church to attain “the unity of the faith” (verse 13) and therefore the church needs these ministries today. However, this way of reading the passage is mistaken because it connects verse 13 directly to verse 11 and passes over verse 12. What Paul says is that Christ gave the church apostles, prophets, evangelists, pastors, and teachers “to equip the saints for the work of ministry, for building up the body of Christ, until we all attain to the unity of the faith” (verses 12-13a ESV). The purpose of the five ministries is “to equip the saints for the work of ministry,” and they do this in different ways. The apostles and prophets’ role in equipping the saints was foundational (Ephesians 2:20), whereas the roles of the evangelists, pastors, and teachers are ongoing. What Paul says must continue is that the saints do the work of the ministry to build up the body of Christ. If Paul had meant that the church needed living apostles and prophets at all times in order to function, as the LDS Church claims, he gives no indication that he thought the church was about to lose its ability to function. To the contrary, Paul expected that the church would continue to be built up and that believers would continue to mature in their relationship with Christ (verses 14-16). “In addition, there was persecutionfrom outside the Church. Church members were tortured and killed for their beliefs. One by one, the Apostles were killed or otherwise taken from the earth. Because of wickedness and apostasy, the apostolic authority and priesthood keys were also taken from the earth” (Gospel Principles, 92). Somehow, Gospel Principles actually blames the disappearance of the apostles on both persecution by outsiders and apostasy by insiders, concluding that God withdrew the authority of apostles from the earth. This conclusion is very difficult to understand, let alone defend. There was plenty of wickedness and apostasy in the nineteenth century, but these ills supposedly did not prevent Christ from appointing Joseph Smith and others as apostles during that period. Many Christians during the decades when the apostles were dying off were zealous, committed believers who upheld the teachings of the apostles, loved others sacrificially, and even (as Gospel Principles acknowledges) suffered persecution and death for their beliefs. Why didn’t the surviving apostles appoint any of these godly believers to serve as apostles for the next generation? When the last apostles died, could Christ really not find anyone suitable to serve as an apostle until the nineteenth century? The better explanation for the disappearance of living apostles from the church, by far, is that Christ intended all along that their presence would be temporary. Once they had accomplished their function of serving as the foundation of the church (Ephesians 2:20), Christ allowed the apostles to die or be killed until no more apostles were alive on the earth. Since Christ never intended that apostles function as the leaders at the top of a pyramidal religious organization, their absence did not remove an essential element of the ongoing Christian church movement. Were the New Testament apostles officers in a religious bureaucracy or hierarchy? If they were not, how does this affect your view of the LDS Church’s claim to have the same organization as in the early church? Given that there was no hierarchical organization running the church in New Testament times, is not the LDS emphasis on organization misplaced? If there was no such organization, how can it be “restored”? If the LDS Church offices represent the restoration of ancient church offices, why do the terms used for those LDS offices (patriarchs, seventies, etc.) not correspond to their usage in the Bible? If Christ intended that the church should always have apostles, why did the first-century church leaders make no attempt to appoint new apostles when such men as James, Peter, and Paul were killed?